Effective communicators, collaborative teams and concise report writers were at the heart of First Security’s goals for their literacy policy when it launched in 2005. A straightforward document with big vision, it was the starting point for the company’s journey to a sustainable approach to literacy awareness across the whole organisation. More recently, the organisation undertook a comprehensive assessment of the company’s workplace literacy needs and discovered that 30% of their workforce (250 staff) still needed intervention. It was clear that something was needed to help First Security achieve its goals. With a goal of getting each learner to achieve their Level 2 National Certificate, First Security brought Upskills on board to deliver extended workplace literacy and numeracy training under the First Skills brand. The people involved told us how the training impacted on them and the business – discover their stories below. First Security Training Manager Yvonne Bruce may not have been at First Security when Upskills were first on board – but she’s no stranger to workplace literacy and numeracy programmes. Since beginning at First Security, she’s been focused on optimising employees’ training opportunities – and making sure that the impact is as widespread as possible. With a team as diverse as those at First Security, communication hasn’t always been easy. At Ports of Auckland, where a mixture of experienced and very new First Security employees keep things safe and secure, there’s such a massive physical area to cover that each person needs to understand a variety of different tasks, from controlling entry and exit to patrolling the area in a vehicle. However, Ports of Auckland isn’t the only site where First Security employees have been busy learning. Over at Sylvia Park, staff tend to be longer serving and the duties remain pretty steady – keeping customers safe during the day, taking care of the entertainment area in the evening, or looking after the property overnight. This meant more cohesion between the team, and great attendance from everyone, which demonstrated that the more you can bring people together for learning, the wider impact it will have. Looking to the future, Yvonne is considering how to ensure everyone can access the same opportunities for learning that Ports of Auckland and Sylvia Park have now had – and how to optimise the training based on lessons learned from both locations. Workplace literacy training is also being worked into the orientation programme, so that everyone has access to support upfront. Although the team were already trained for the site, we realised that reporting wasn’t quite up to scratch. With an added obligation to take people up to a Level 2 qualification, additional workplace training was the perfect opportunity to kill two birds with one stone. The collaboration with Upskills and the implementation of First Skills ensured that employees built sustainable and transferrable skills. The positive impact of the programme is clear. “I’ve seen quantifiable improvements in our report writing since the beginning of the course. We’ve also been running management training for supervisors and I’ve seen real evidence of improvement of their briefing structure. This has enabled them to be more productive and streamlined in getting information across to staff,” says Gwynn. Lago Sanonu, Security Manager at Sylvia Park, agreed, sharing that for him, the biggest relief was being able to trust in his team more and relieve some of his stress. 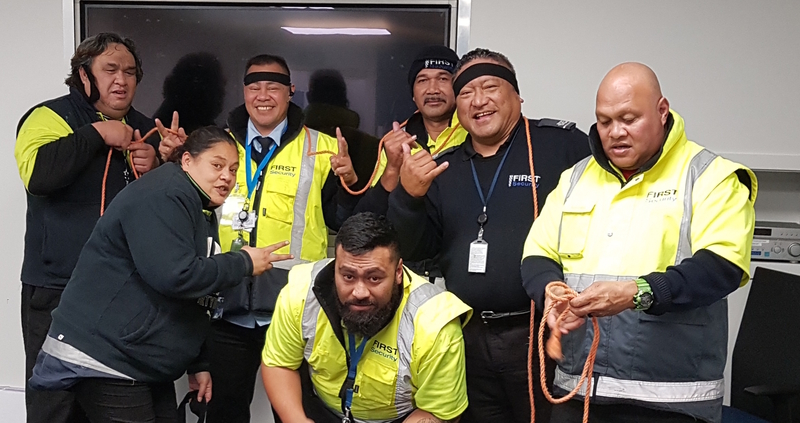 Workplace training is only effective when learners engage and get excited about their development – and Gary Tuiletufuca, who works under Gwynn as part of the Ports of Auckland team demonstrates just that.